This article made front page CNN this morning. -Because of my experience interning with USCCB, it's funny to me that I actually KNOW the people mentioned in the article, know who wrote those letters that I read during work, and have met in person even the bishops mentioned. -It mentions one of my new favorite words I learned from the conference---subsidiarity, which means addressing an issue by referencing those closest to the issue. -Finally the article (and debate) touches on a issue that I found to bother me and something I realized while working at the conference. On the second floor, my then-office was directly in the middle between the "social justice" side (Justice, Peace, and Human Development) and the "pro-life" side (Pro-Life Issues). It seemed to symbolize the main division between our Catholic vote. Working for JPHD, I definitely started to recognize some pretty important Catholic issues on social injustice and serving the poor while on the other hand, at Catholic I have been educated on the value of protecting unborn children. I remember in July while the Fortnight for Freedom was in action trying to defend our religious liberty the Nuns on the Bus tour was taking place lobbying for the rights of poor people. I found it to be a beautiful picture that the Church fights for great values on both sides of the spectrum. There's one important thing I want to say here: I think it's very important to note that it is still Catholic to vote one way or the other. As great of a university as CUA was, one thing that bothered me was the culture definitely emphasized the "pro-life" Catholic more, which was generally Republican, leaving the "social justice" minded-Catholics, which was generally Democrat, as a minority and "wrong" and sometimes even shun. Polls show that Catholics are pretty much split down the middle in our country, and that's OK, because as Catholics we're called to be "politically homeless", Catholic first, partisan second. There are a lot of Catholic merits to both values Democrats and Republicans present and it's up to our conscience to decide what we value more along with other issues like the economy, war, and education. I just think it's unfortunate that we have to choose. 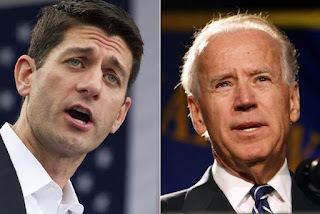 One thought that worries me about the VPs getting so much attention is that Catholics may think that they're actually *voting* for either Ryan or Biden. But come Nov., the choice won't be between two Catholic VPs, but rather between two tickets that represent very different administrations and ways of running the country. We have more to take into consideration than just the particular leanings of these two men.